As the evenings begin to draw in, many Austineers’ thoughts turn towards their lights and charging circuits. I’m not intending to open the debate again over 12V conversions, but I have to admit that 12V lights are both brighter and easier to obtain. Either way, the lights are precious little use without some electricity to drive them. There seems to be a significant proportion of 'Sevens' having either weak or defective charging, and so limiting the helmsman to only running for shortish periods in the twilight. Therefore, I thought a few reminders about charging, the effect of the summer/winter charge switch and how this relates to both 6V and 12V might be in order. First thing to note is that the 'Seven' evolved over about sixteen years and underwent a few changes during the development. Hence I shall attempt to describe the principles and how they apply, leaving the reader to relate these to their own installation. 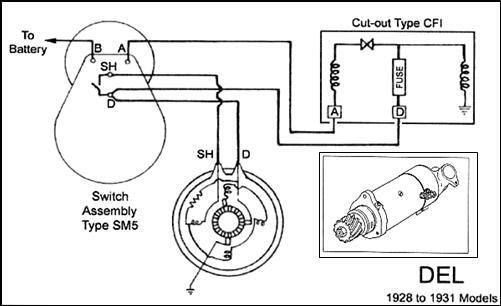 All Austin Sevens source their electricity from a dynamo, which is connected to, or disconnected, from the battery by means of an automatic switch, the cut-out. For our purposes, we’ll ignore the cut out, so that we can focus on what happens when the system is supposed to be charging. In the simplest of installations that is all there is. Up to 1928 the charge level was fixed just by the third brush and the driver couldn’t influence things from behind the wheel. 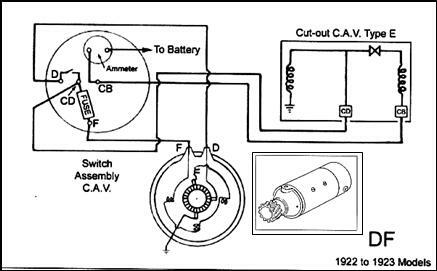 However, in 1928, the system gained two more components, these being a summer/winter charge resistance and a switch. These appear on all 'Sevens' since then, all work in the same way electrically, even though the parts vary by age (or availability during the car’s life). This is an important point, as not all dynamos are interchangeable without ensuring that other appropriate changes are made to the car’s charging circuits. More of that later. There are five variants, but all have the same principle of operation. There are two sets of windings, the field and the armature. A current (from the battery) is passed through the field winding, which forms a magnetic field inside the dynamo’s iron casing. Hence the name. The armature rotates inside this field, inducing current into its winding, which is the main generating part of the dynamo. This is the current that is used to charge the battery, light the lights, and power all the other luxuries with which our cars are fitted. The dynamo has three brushes, the purpose of which is to make a low friction connection to the windings as they rotate. One provides a fixed point of connection for the main armature winding, and just needs to be clean and in good condition on its spring. A second provides a connection to earth for the armature, and is similar to the first. The third brush connects the field coil into the circuit for the armature and is moveable. This allows the field to be distorted in a controlled manner, which changes the charging characteristics of the dynamo. Setting of this brush will be described once the rest of the system is out of the way. 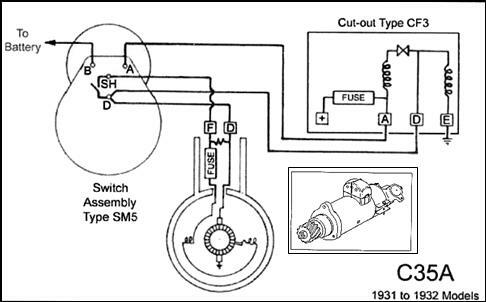 There are two very important and very different ways of changing the charging characteristics of the dynamo (well, three if you count engine revs – none of them charge with a stationary engine). For purposes of simplicity, they can be regarded as coarse and fine control. The coarse control over charging current is determined by the amount of field current that flows through the field winding. If no current flows (because there is a brush fault, a wire broken or a failed fuse) then there will be no charge. (A sensitive meter will detect a little, but this is just due to the weak permanent magnetism in the casing). Lots of field current results in lots of charge, which is only a good thing if this current can be consumed (i.e. if the headlights are on or the battery is very flat). Pushing lots of current into a well charged battery will, at best, boil it dry, and at worst ruin it completely. So, to reduce this current, all Austin Seven charging circuits from 1928 on have a resistor in series with the field. The coarse control is provided by the driver and the summer/winter switch. With the switch in the Summer position, the resistor is in series with the field winding, and the charging should be limited to a few amps (typically 4 or 5 – this is plenty for daytime running). However at night, especially for the original 6V system, this means that the ignition and the lighting is using more current than the dynamo can provide, the end result of which will be a flat battery, no lights and a failure to proceed. With the switch on the Winter setting (and especially with the Ruby and Box Saloons, where the switch is a multi position type which also operates the lights), the resistor is shorted out, allowing much more field current to flow. This makes the internal magnetic field of the dynamo stronger, which results in lots more charge. This can be as much as 12 or even 15 Amps, plenty to maintain the lights and still leave a little to recharge the battery. Note that the ammeter only indicates the current going to the battery, not the total output of the dynamo. Hence just an amp or so of indicated charge will be plenty to guarantee that the battery doesn’t go flat. Where the field resistance is physically mounted varies from type to type. Moreover, for a 12V conversion, it is important that the resistance takes into account the higher battery voltage. Usually, this will mean adding extra resistance to take the current back down. For vehicles fitted with a CAV switchboard, there is no summer/winter setting and consequently no resistor. The DF or DFL dynamo is operated at full charge at all times. For the Chummy etc, up to 1928, the SM3 switchboard introduced a half charge setting. This used a shunt resistance behind the switchboard, across the D and F terminals. For short wheel base and other vehicles still fitted with electrics from 1928 to 1931, the dynamo is a DEL type, fitted with an SM5 switch panel. Whilst very similar in appearance to the SM3, the resistance is no longer behind the panel but is actually wound around the field coils inside the dynamo. The Summer/Winter switch connects between the D terminal and the F terminal, which shorts out the resistor inside the dynamo. Repairing these windings can be a real pain, which is why (according to Harry Hale, the expert,) many of the DEL types are simply used with the resistor open circuit, or replaced for later machines. Again, there has to be some appropriate modification of the circuit – they might fit mechanically but need some other changes electrically. For cars fitted with an early Lucas C35A dynamo (originally 1931/33), the resistance is actually inside the Bakelite box on top of the dynamo. These were paired with a CF3 cut-out, although they also work with a CF1 cut-out. As with earlier cars, the summer/winter switch shorts out the resistance by connecting the D terminal to the F terminal. For the Box saloons, Ruby and other cars fitted with a later Lucas C35A dynamo, or a C35M in the case of the very late Ruby, the resistor isn’t fitted to the dynamo but is fitted INSIDE the cut-out. Cut-outs having an internal resistor are designated with an R, i.e. the CFR (Box type) and the CFR2 (Ruby type). The summer/winter switch now shorts out the resistor at the cut-out, thus changing the current into the F terminal of the dynamo. Now it can be seen that if the cars have had a dynamo or cut-out changed for a different type during their life, it can be difficult to get the correct charge. For example, if a car that was originally fitted with a dynamo having an internal resistance (or one mounted on top) is now fitted with a 35M having no resistor, it won’t charge at all on Summer, (as there is no path for current to get into the field) but will charge on Winter. Some other path is needed, either by changing the cut-out for one having an internal resistance (such as a CFR) or by adding a separate resistance between the D and F terminals, to replace the one that is missing. 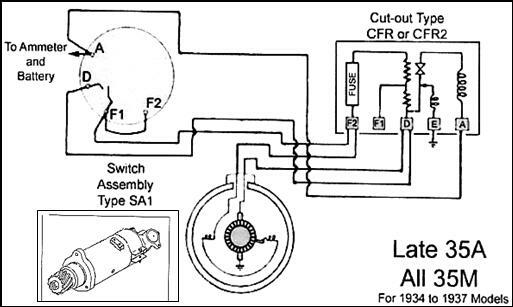 This is particularly prevalent in cars that were originally fitted with an early C35A with a resistor on top to a later C35A without the resistor. The easy cure here is to add a resistor across the D and F terminals, made from some resistance wire. Similarly (but probably less likely), a Box saloon having a CFR cut-out fitted with an early C35A dynamo will charge well in winter, but will still charge too hard in summer. This is because there are now two resistors in parallel feeding the field (one on top of the dynamo, one in the cut-out). An ideal test aid for diagnosing charging faults is a 12V 5W sidelight bulb with two bits of wire. This has a resistance of about 2 Ohms when lit, (a bit less when glowing) and acts as a good ammeter – it lights up! Disconnect the D and F wires from the dynamo. Connect the test bulb between the battery, (such as on top of the starter motor) and each of D and F terminals on the dynamo in turn. If bulb doesn’t light, the brushes or the windings are faulty. Reconnect the D terminal; connect the bulb between the F wire and earth. Bulb should be bright on Winter setting, dimmer on summer setting. Very early cars having CAV switch assemblies, check the fuse at the panel. For cars with CF1 cut-outs, e.g. the Chummy to 1928 and short wheel base Boxes to 1931, check the fuse in the cut-out. For Box Saloons etc fitted with CF3 cut-out and C35 dynamo having the resistor mounted on top, check the fuse AT THE DYNAMO. The fuse in a CF3 cut-out only protects ancillaries such as the fuel gauge. For Box Saloons, Rubys and cars fitted with CFR or CFR2 cut-outs – check the fuse at the CUT-OUT. Resistor failed, (or not fitted). Check by connecting bulb between D and F terminals on dynamo. Should give some charge on summer when bulb connected between terminals. CFR and CFR2 types can have resistance wire replaced. 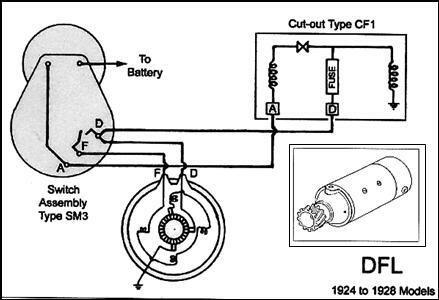 If not a CFR type cut-out, a separate resistance can be connected between the D and F terminals either at the dynamo or at the switch. Low charge: Switch not connecting across resistor, often caused by wire link missing from switch assembly for Box saloons and Ruby. High charge: Wiring fault, or as low charge but with excessive third brush advance. The objective is to set the third brush such that the system charges gently at 30 MPH on Summer setting, or just doesn’t quite discharge at 30 MPH on winter setting with the lights on. Stop the engine, isolate the battery and remove the dynamo cover. The third brush can be moved either by finger pressure or by using a soft tool such as a length of dowel. If using a screwdriver at the side of the road, take care not to chip the carbon brush itself. To increase the charge, rotate the brush in the direction of rotation of the dynamo., taking care not to move it too far. (If you push it right to the end, it can short onto the other brush. To stop this happening, always back it off a shade after moving it). To reduce the charge, move it back. Note that it is unlikely that a perfect position will be found – in the winter, when lights are more likely to be required, err on the higher charge. In summer, move it back. Whichever set up the car has, when changing to 12V additional steps must be taken to ensure that the field current is reduced. There are two reasons for this. Firstly, the higher battery voltage will mean that a standard resistor will pass twice the current it would have for 6V, and secondly the car only needs half as much current anyway to cope with ignition, lighting and so on. One of the easiest things to do is grossly overcharge a 12V battery. Exactly how this is achieved depends on the installation. As these are ALL non-standard, you are invited to contact the author via the Webmaster for advice. This article, written by Geoff Hardman, originally appeared in CA7C Seven Focus in Oct 2007 pp 17-22.